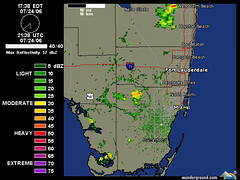 Check out these giant bubbles that were percolating in the atmosphere of South Florida today. It is on such a grand scale. Makes one feel rather insignificant. Be sure you read the comments under the image and click on the animation link to see the action. Summer is here. The high temperatures and humidity have made at least some of our residents happy. These are our Angel Trumpets or Brugmansias which have been blooming their little hearts out. We have to keep them well fed while they are so productive. So, we fertilize every other week. Some of these were cuttings just a few months ago. The Mothership is back in her docking station. We arrived yesterday around 4 pm. At the same time a severe thunderstorm or squall line arrived. We could see it ahead of us when we were about a mile from home, a big, black, fast moving, nasty looking cloud. We even heard a few spatters of hail as it swept across our path. We stopped on the street in front of our house waiting for the storm to pass by. Connected to our wirless network in the house we were able to use the laptop to check out the radar at Wunderground.com and could see that the squall line would move out over the ocean soon so we waited. Stay tuned for more of our adventures in getting a new throne installed in the Mothership.